This is a real simple, very healthy bread making technique. 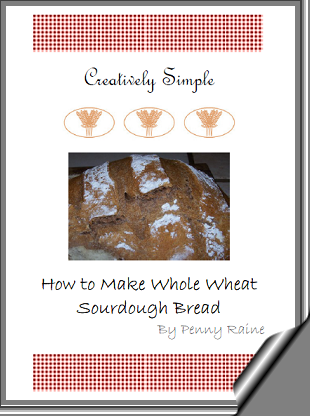 It is low fat and high protein with lots of fiber making it a very healthy bread. It is also extremely yummy. I have been on a work out and healthy eating plan for the last couple months trying to lose all the weight that accumulated from a busy “Momma to many” lifestyle. I find that I lose weight faster if I eat a slice of this bread daily. I am not saying that will work for you but it has been working for me. This simple technique can be started one day and baked from the next. It is not a continuing sourdough so it never gets an off flavor. Hint – try it with some homemade butter, but not too much.